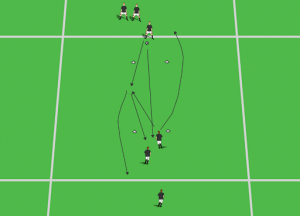 Here is a competitive technical passing drill to add to your coaching toolbox. He comes complete with progressions and variations. Coach Gillies is a nationally licensed coach through the USSF and is a Youth Athlete Development Specialist and Head Coach at Mount Laurel United Soccer Club, where he currently coaches a u14 girls team, the MLU Raptors. 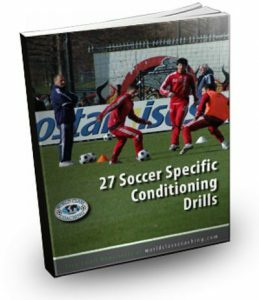 He also is the owner of www.NoLimitsSoccerTraining.com, where his focus is on maximizing a player’s individual technical skills, soccer IQ, and overall athletic development. The players, in pairs with one ball, are to complete as many passes as they possibly can through the cone goals scattered thoughout the playing area, in a set amount of time (30 to 90 seconds). The team with the highest number of completed passes wins. Players can not complete multiple passes through the same goal without going to at least two other goals first. You can vary the number of goals and size of the playing area to make the drills more or less difficult. The smaller the area, the more traffic that each team needs to be aware of and avoid, making the game more challenging. Make the receiving player of a pass that scores a goal call out the number of that goal, loud and proud. This helps with getting players to talk, especially at younger ages. The accuracy and pace of the pass, as well as good communication between players on a team are extremely important in being successful at this drill. Players need to keep their heads up and be aware of their surroundings so they don’t run into other players or have a pass fail because it hit another player or another teams ball. The quality of all touches is important so traffic can be avoided, causing time to be lost if a ball is knocked away via a collision with another player or another ball. Set Up: See below in diagram two. Divide up into multiple teams of four to six players. The cones that need to be passed through and the distance between the cones will depend on the skill level of your players. 10 to 12 yard passes are long enough distance wise as we are looking for quick, quality passes on the ground with at most two touches, one if possible. Passes must go between the two cones in front of the player you are passing to. That player can then play a one touch pass or take a first touch. The return pass must also go through the far two cones. When a pass is made, that player goes to the back of the next line. The teams are competing to complete the most number of passes in a set time like 30 or 45 seconds. Any pass that does not go through the far two cones, does not count. This is true if the pass goes wide, but also true of the receiving player steps up and takes their first touch ahead of the cones without letting the ball travel through. Focus on accuracy and weight of the pass. A good, solid pass that allows a teammate to return it with one touch will give a team the ability to complete more passes in the time allowed. The more touches a teammate must take to control the pass, the fewer total passes that will be completed. Whichever team completes the most number of passes wins. The competition and cones takes a simple, boring passing drill and dramatically increases the intensity and focus of the players. Same Set up but add a 1-2 into the senquence as shown below in diagrams 4 and 5. In this version, count all passes completed that go through the cones. These drills and variations are a great way to work on technique without defense but also add an ellement of pressure and intensity (as well as focus) that you don’t get with typical drills. Adding that element of competition can help players more quickly develop their technique and skill. One last thought on the competition element. You can create two (or three or more depending on total number of players) to make it one overall competition by adding the total number of passes completed through each variaton. For example, let’s say you have 12 players and in the team passing drill, you have 3 reams, which is 4 players per team. For the first drill, when they are working in pairs, separate them into 3 teams of 4 players and then into pairs within each team. The total number of completed passes is the total of the passes completed by the pairs within each team. Then keep the same teams throughout all variations, with the winner being total number of passes completed throughout the session. 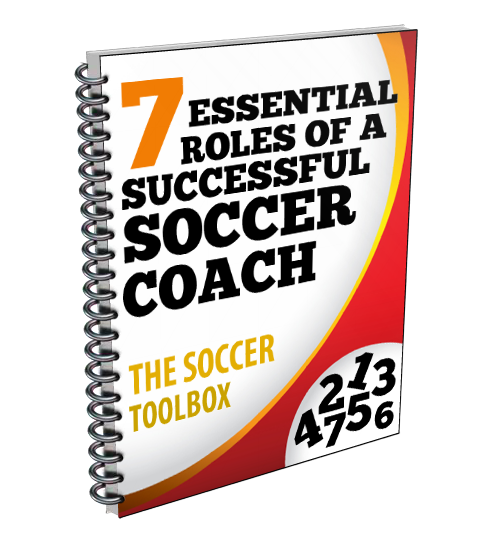 World Class Coaching provides a variety of free resources for coaches. Just click the images below for copies of the free eBooks. Really appreciate that great drills. Thank you so much.